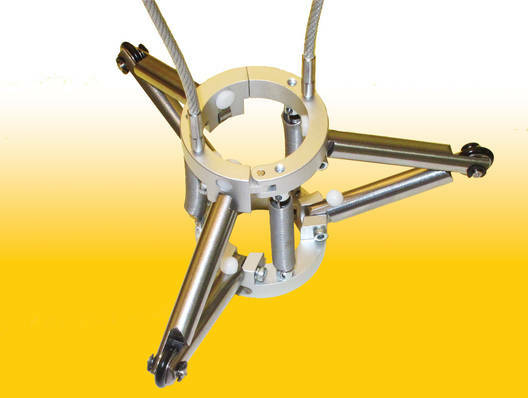 The MICROTEST® -Tripod supports the internal micrometer with extension to achieve an optimal pre-centring of the whole unit in the deep bore hole. The measurement unit can be introduced on rubber rollers without scratching the bore. From 1.5 meter extensions onward it is recommended to use our MICROTEST® -Tripod, similar to Bessel‘s rule. In the case of very long applications further tripods should be fitted for support. To guide the MICROTEST® tripod via radial recesses, we supply appropriate cables for this purpose.